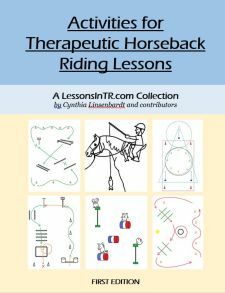 “Ask then tell” – soft aid first, then stronger if the horse doesn’t respond. Use the 4 “natural aids” – hands, legs, voice, seat. Note: some instructors prefer their students to pull to their belly instead of their hips, because they feel it keeps them centered instead of leaning to the steering side, and that touching their belly makes them sit up straight. Note: as much as I don’t like to use the word “pull”, I haven’t come up with a better one except “bring”, as in “bring your right hand back to your hip”. All aids start at the seat. When you change your seat and weight, it automatically affects all the other other aids. All the aids are connected. When you use one, it affects the others. Therefore you never use just one aid, but many in unison. I think these insights are great for teaching your students. It opens up some new opportunities for how to teach students aids. 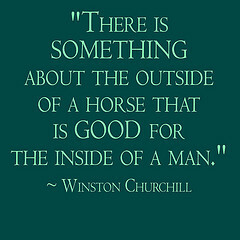 Also, it opens the eyes of the instructor that all the parts of the body are connected – even if you are only having the student use one aid at a time, their body will still be doing more than one aid due to how changing one part of the body affects the others, either helping the student complete the skill or telling the horse to do something different. What about you – how do you teach the basic aids? What words do you use?